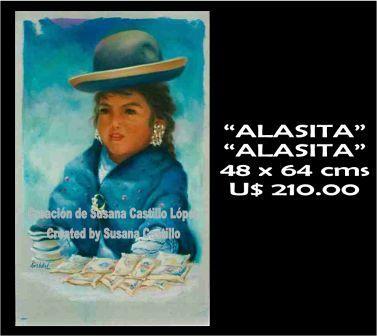 Susana Castillo is an Award Winning Bolivian Artist Who Exhibits Worldwide. She was born in La Paz, Bolivia and attended the Mariscal Braun German school during elementary and high school, then went on to study art at the Universidad Mayor de San Andres School of Architecture in La Paz. She then obtained a B.A. in Art and Interior Design from the University of Texas in Austin. From there she moved to Madrid, Spain where under the tutelage of Master Eduardo Peña she specialized in portraits at the "Artrium" Academy of Arts. Further on, she attended the Scottsdale, Arizona School of Artists where she studied under Canadian portraitist Harley Brown. 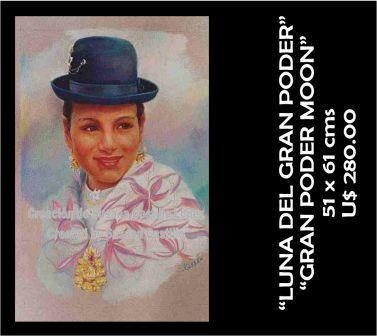 Since 1989 she has participated in over 60 individual and collective exhibits, some in Bolivia and others in Argentina, Peru, the United States and Spain. She paints with watercolor, creates bronze and clay sculptures, is also an accomplished photographer, and works with other materials as well, such as ceramics, wood, glass, and tin. In Arizona and Florida she has received numerous awards for her portraits and sculptures. 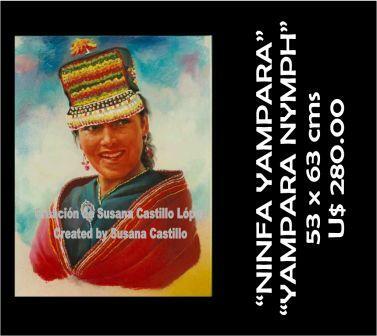 In Bolivia she has won first place in national photography contests and for posters she created for publicity campaigns. Because her work appears on so many cards and postcards, she is also well-known in several continents. 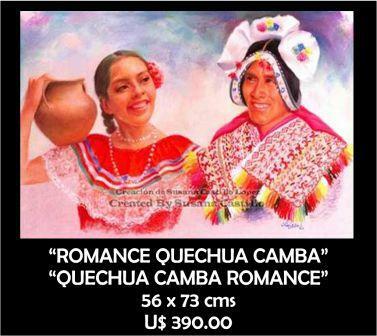 Among some of the over 160 portraits she has been commissioned to paint is that of Pope Benedict XVI and she has also painted or created works of art for several national and international authorities, including Bolivia's current President, Evo Morales Aima. 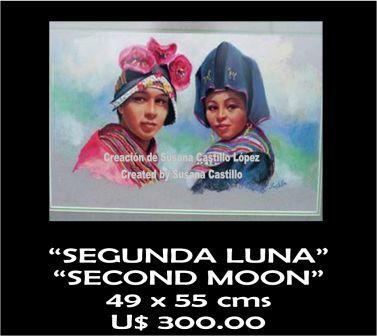 The following paintings are one-of-a-kind originals on exhibit at Susana's studio in La Paz and are for sale. There is only 1 of each original painting. 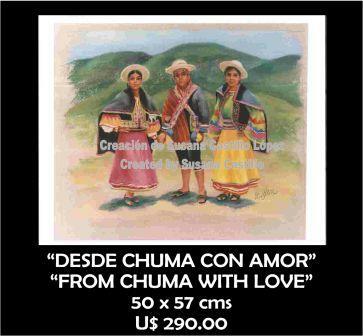 Sizes and prices are indicated on each painting below, underneath the name of the painting. 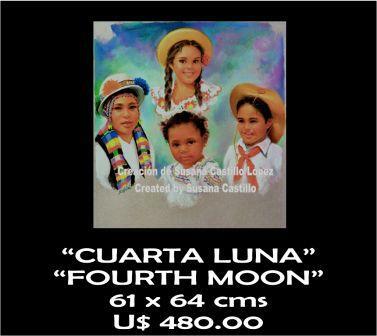 If you are interested in purchasing one of the pieces below, a larger photograph with greater detail can be provided. All are done in pastel paints. 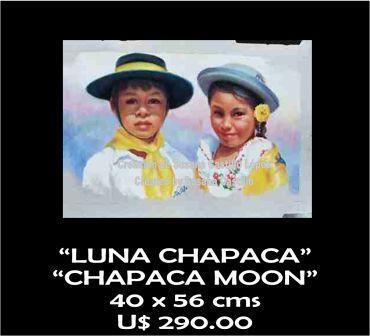 For sale and shipping overseas painting will be shipped without a frame and rolled in a tube for protection. 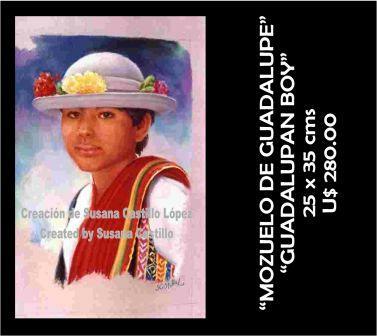 ("Created by Susana Castillo" watermarks that appear on the photographs of the paintings below do not appear on the original paintings). 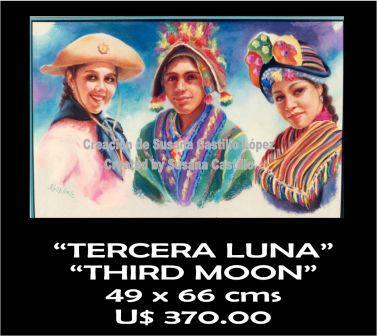 Please contact Susana Castillo López using the form located below the prints for purchase, payment and shipping information. 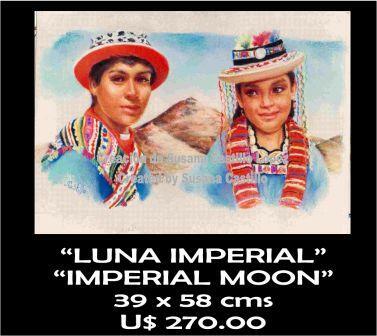 (Shipped from La Paz, Bolivia to destination). This first painting ALASITA recently sold - but you can still enjoy it here.